Erin found this little guy last month while hunting geoduck. He's green, fuzzy with hair, and very crabby. We did a little sleuthing and decided that he's likely a helmet crab. 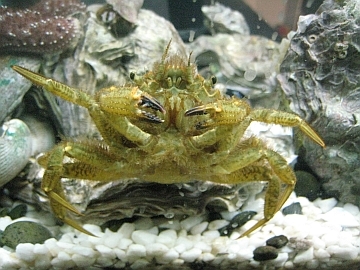 According to this site, helmet crab live in the north Pacific and are rarely found south of Puget Sound. They live out deep (low intertidal to 110 m) in eelgrass beds and rocky areas covered with algae.